My D700 was several years old. At least six or so and probably longer. I got it new when the D700 was a current model. It had a shutter count of 62,000 and change. It has a faulty hotshoe (sometimes it worked and sometimes it did not.) Came with book, strap and two batteries. That's it. No lens. Still, I got $585 for it!!! I think that's pretty good. I inquired a couple of years ago what B&H might pay me for it and I can't remember exactly but it was next to nothing. Maybe $100-$150 (And that was before the hotshoe went.) Of course I described the hotshoe problem in the eBay listing and also alerted potential buyers to it in the title. Other D700s on eBay are going for what looks like an average of $700. Some more, some less. But I had the hotshoe issue. Eight or 10 years ago I switched from Canon to Nikon and sold all my Canon gear. I was pleasantly surprised at how much I got for it. So if you're considering switching brands, don't let being heavily invested in one brand stop you. It's also a good place to check out, and I often use this as a guide for what my used gear is worth. Good to know! Thanks Neil. I'll check our Fred Miranda. I have used fredmiranda.com in the past, and it worked pretty well. The site is read by professionals and enthusiasts, so you have the audience you want to sell to. The "downside" is that in order to sell anything, you have to buy the ability to do so for a set amount of time. They offer periods of 30 days, 3 months, 1 year, and 2 years. This is in contrast with eBay where listing is free and eBay collects only after the sale is made. So, if you don't sell stuff frequently or sell a lot of stuff, the longer-period plans may not be cost-effective. For example, in the past, I sold a good Nikon lens. Looking at the listings, I had reasonable confidence that it would sell for a price I wanted, and I didn't have anything else to sell afterwards. So, I chose a 30-day plan. Thanks Stephen. That's interesting about paying for a set period of time to list stuff. Do you also pay a percentage of the sale to FredMiranda? I looked on the site but did not see where fees are listed. I did see that there's no auction format. So some may like that and others may not. For me, I feel I can get the best price via an auction. But yes if you have a price in mind and that's it then a straight sale may be better (although you can set a reserve on eBay). Don't you pay a listing fee with eBay too? I know you used to, maybe they changed that. I know you pay a percentage of the sale but I thought you also paid a small listing fee. You are right Skip, you do pay a fee but they call it an Insertion Fee then you pay a Final Value Fee, and it's slightly more than 10%. Eg: You put a 'starting price' (Reserve Price) in and an 'Sale Price' so it's like an estimate you expect, well you pay for those, say you have a lens, you put in $110 'starting price' and you expect to get $150 in an Auction Style Sale, your Insertion fee is $3.50 and your Final Value Fee is $14.85 for a Total Fee of $18.35. Now you are charged exactly the same price if you choose a Fixed Price (Buy It Now) on that same 'Sale Price' of $150. Now that is before you add 'extras' like a schedule listing and a 'Sub Title' which is an extra $2.00 so total is then $154.00 so, you would need to think exactly what you want and try to recoup with a higher 'reserve' (Starting Price) and hope you get it. That's with 'Free Postage', so I then choose $25.00 Domestic Postage, suddenly the 'Final Value Fee jumps to $150.98 so you are also being slugged on your Postage. PS: 'The Devil is in the Wording' - If you say, 'There is a Listing Fee to Pay' it sounds bad, but, if you say, 'For a Small Insertion Fee of . . .' it sounds better. Like $149.99 sounds better than $150.00 - just human nature. You pay a very small annual fee on Fred Miranda to be able to post there. That sounds like a better option then, as $150+ coming out of $1500 say, is a pretty large chunk of change. Thanks for all that info Trev. Yes, that's what I thought, re the insertion fee. But wow, I did not realize the percentage paid to eBay was almost 10 percent! Yikes. This means I'm paying almost $58 on the camera I sold. Plus insertion fee. This makes Fred and Miranda much more attractive, although you lose the fun and possible benefit of having an auction. I am familiar with the option to set a reserve price. I usually don't do this unless something is very valuable. I usually just start at a price I can live with it it sold for that starting price. I started the D700 at $350 but was confident it would go up -- even with the hot shoe problem -- as others are selling for $700 and up. Reserve and starting prices are different. A reserve is a hidden amount that bidders must meet or exceed to buy your item. I don't know why sellers bother with that rather than just starting the auction at the level their willing to part with something for. But I think one reason is it's better to start the bidding low to attract interest. Still, there's an extra fee to have a reserve price and some think it's a deterrent to bidding. 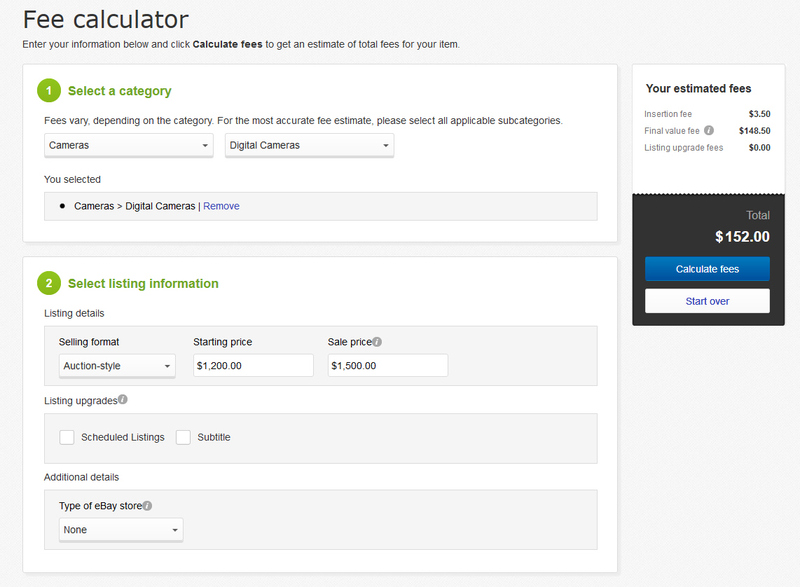 That is good to know about the fee calculator. Obviously I did not know how much I was going to pay eBay in the end. I doubt I'd have done anything different but maybe. Sorry, skipperlange, I was out of town. Depending on what you sell on eBay, the listing/insertion fee may be free. When you sell something on eBay (except automobiles and houses), eBay takes 10% out of the final price of the item and 10% from your shipping cost when it sells. Unless Neil has been given a preferential rate, fredmiranda.com lists these as the time period subscriptions. Those prices look about the same since I last used it 2 years ago. $29 for 1 year or $49 for two years is a pretty good price, but like I said, if I expect to sell only one thing (I'm not a working photographer like Neil) for the given year, $29 is too much to pay for me. As Neil said, if you sell on fredmiranda.com, they do not collect any additional fees. If I were to sell something on eBay, I wouldn't even bother with letting people bid up the price or set a reserve price. Use the "Buy It Now" function and set it at a reasonable price. You can also activate a "best offer" option, and enter the range of values where you would automatically accept the offer and automatically reject the offer. For example, you could list a D700 at a buy it now price of $800 USD and set a best offer, where you automatically accept any offer above $750 USD and reject any offer below $700 USD. It's a lot more straightforward, and you don't have to worry about somebody winning your item at too low of a price. I might try Fred and Miranda next time I'm selling something expensive to avoid the generous cut to eBay. I do this the auction format is fun. On the other hand, I waste so much time checking it constantly that it becomes a big time waster Under my control though I know. :-).